Once an Account Manager creates a new account, the Manager can add, a team member, or multiple team members, to an Account Team. This blog is a sequel to my previous blog – Getting Started with Process Builder – Part 80 (Auto Add Member to New User’s Default Account Team). As you may recall from my previous blog, an Account Team is a set of users that usually work together on an Account. A typical Account Team may include Account Manager, Sales representative, Legal advisor, etc. In the previous blog, I discussed how to automatically add a member to new user’s default account team. 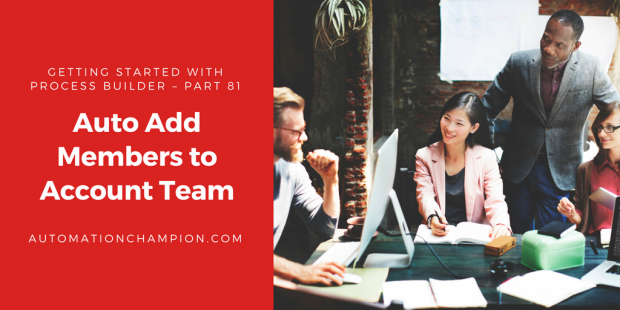 In this blog, I will go one step further and discuss requirement #2 – how to add multiple team members to an account team. Before we proceed further, let us understand the characteristics of an AccountTeamMember object – It represents a User on the default account team of another User. ContactAccessLevel/OpportunityAccessLevel Set Access level for account, case, contact and opportunity objects. First of all, we will create a new Custom Label to store the Legal Advisor’s profile ID. Click on New Flow, it will open flow canvas for you. Once done, Save the flow and name it Add Members to Account Team, with Type: Autolaunched Flow. Do not forget to activate the Flow by clicking on the Activate button. Next time, when an Account is created by the user, the process we created ( Using Process Builder) will fire and add Legal Advisors, to the Account Team. I hope you enjoyed, and learnt, from the duo blogs, how to add, an individual team member, and multiple team members, to an Account Team. Mastering these skills will enhance your productivity and propel you to try various permutations and combinations to incorporate automation in your day-to-day processes and procedures. ← Top 5 Lightning Component Gems of Salesforce Spring’18 Release! Hi Rakesh, great article. But, is there any way I could reverse this process? Like Whenever I add Account Team Member on Account, I want somehow update the account record with some value. If you could share your view on this? You have a very limited option. First – try to write Apex scheduled job which will run every night and perform the necessary action. Second use Inline Visualforce page and Flow concepts. Thanks for this guide. I am doing something similar but I am only creating when there is no team member with that role already in place. When there is one, I update the user on the team. My problem is my Fast Update does not work, I am checking the values I am passing to the SObject and it looks correct but update is not working. Insert works great. Hello, great article! I read both this blog and part 80 on how to add multiple users to account teams – but I was wonder if it is possible to add multiple users from the user object, rather than the account object. So when a new user is created using “abc” profile, automatically add every user with “abc” profile to that users account team, while also adding the new user to the other users account team? This is my current use case that takes me way longer than needed, especially when there are 30+ users with that profile. Yes it is possible to achieve it using Flow and Process Builder. Can you provide a screenshot of what you’re seeing or error message you are getting? I don’t have any examples or errors as I don’t know where to begin with this task. I am very new when it comes to flows so my knowledge is really minimal. I attempted to follow your instructions from this blog modifying the object to user rather than account and had no luck. No error of any kind, just didn’t work. Any help you could provide I would greatly appreciate!